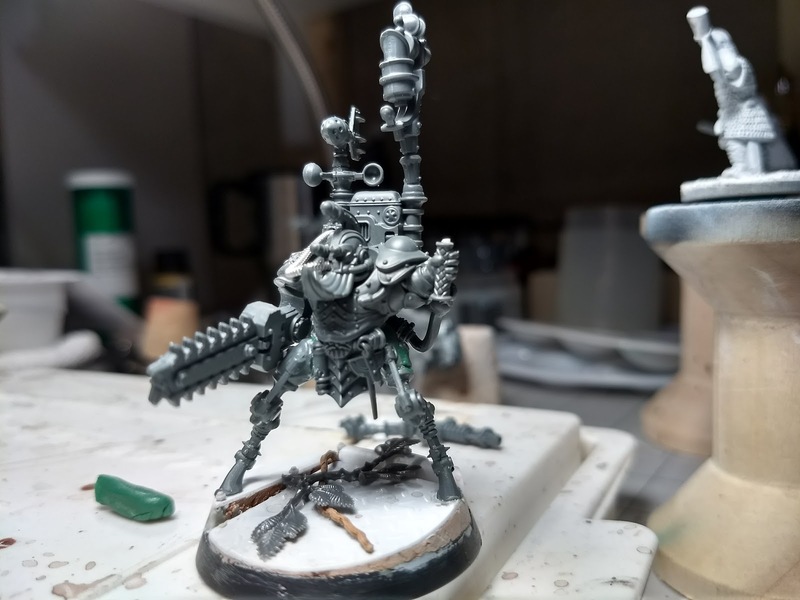 I've hinted a bit of the background of my group for the Immaterium Sargassum but I'm not going to give away too much yet. 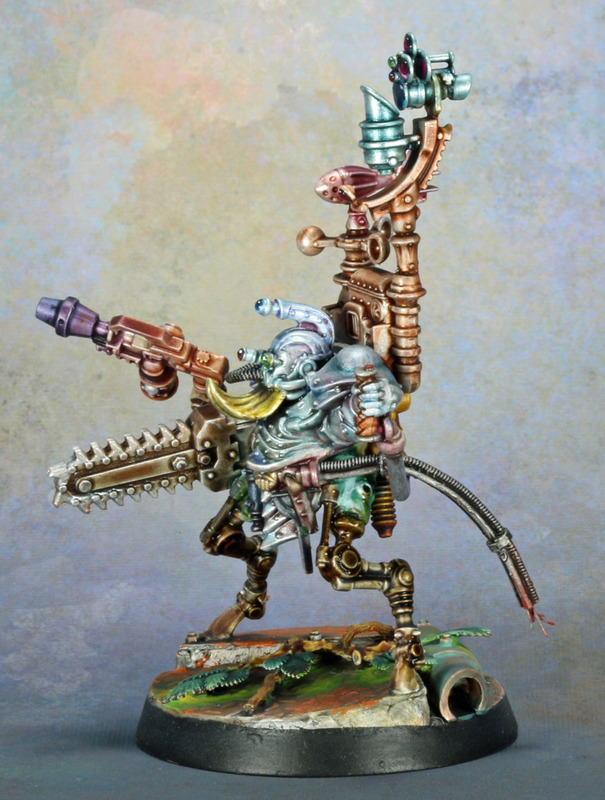 The first model is a mad squat engineer. 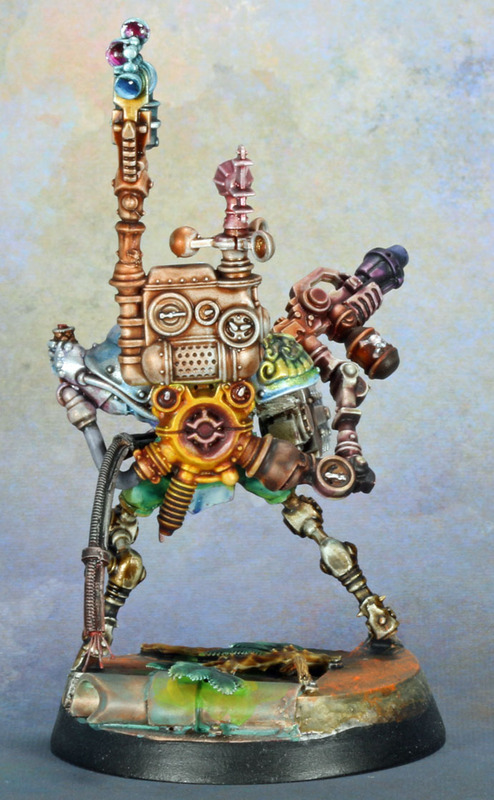 He's based on one of the Aetheric Navigator with the legs of a Sicarian Ruststalker. 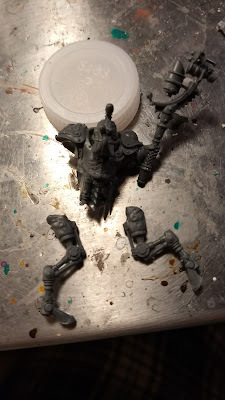 After that, I rejigged the backpack and added an Imperial Guard Sentinel Chainblade as an arm. From the outset, I wanted him to have an ethereal, dreamy quality to him. 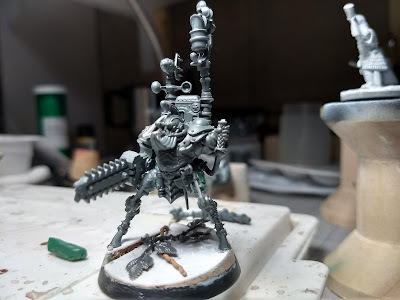 My main source of painting inspiration was Don Hans' amazing blog. Painting him was very simple. 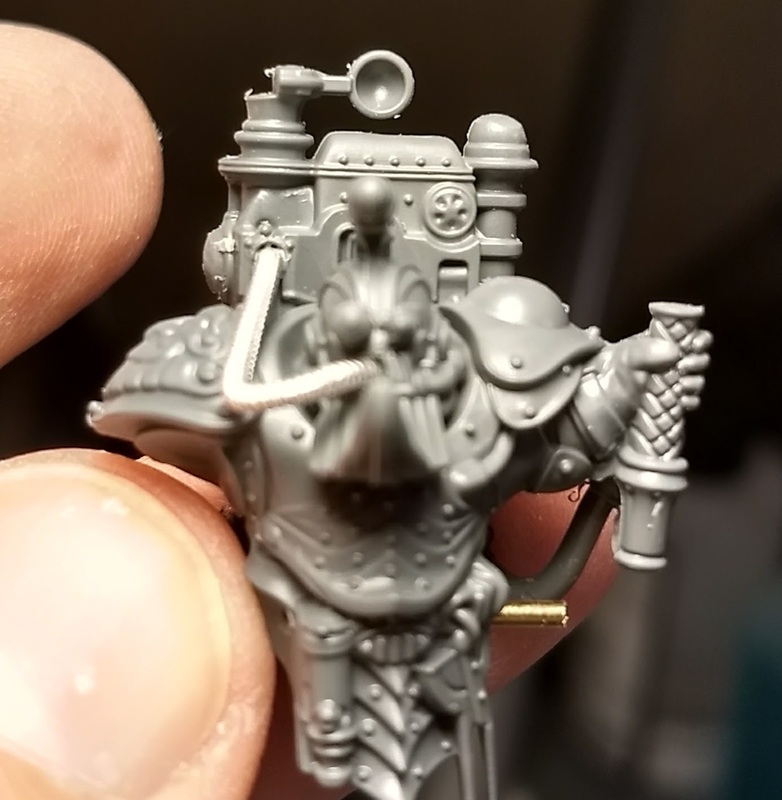 First, I primed him with Vallejo Silver primer. Then, I picked up three Liquitex Acrylic Inks in metallic shades: Silver, Gold, and Bronze. Basically, I thinned each color with a future floor mix and slathered them over the model. I didn't worry too much about painting within the lines. After I was happy with the bases, I then slathered a series of thinned Citadel washes in various places. I tried to apply the washes in various places, making sure to get overlap while the colors were still wet. The only parts that weren't painted this way were what was left of his pants, the handle of his joy-stick with it's big red button, and the colored lens. But even then, the pants were still painted with desaturated colors to keep the dreamy effect I was after. It didn't quite work out as ethereal as I had wanted, but overall, I am still very happy with him. Well this is utterly original and I must admit doing a double take ! I think the painting is excellent and perhaps some of your best so far. I immediately thought of Don Hans before reading the confirmation ! Thanks! I'm glad I evoked the work if the brilliant Mr. Hans! Lol, that phrase amuses me for some reason! Really interesting painting technique Andrew. It worked out great! 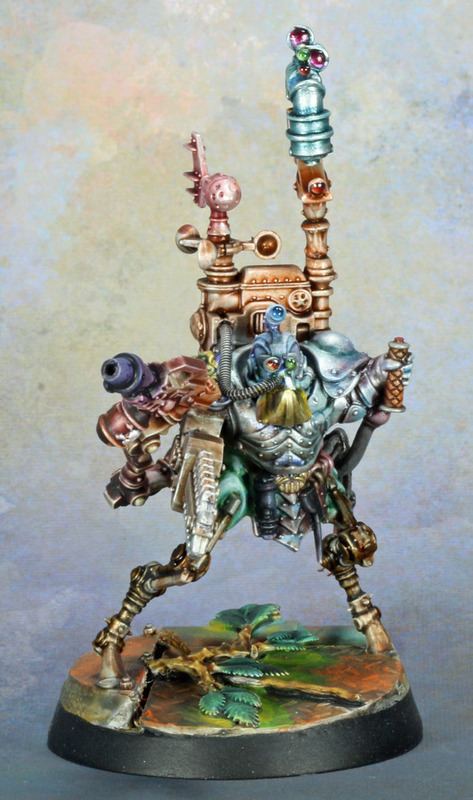 Hehehe, really cool conversion and paintjob! Love the blue you achieved on the armour! 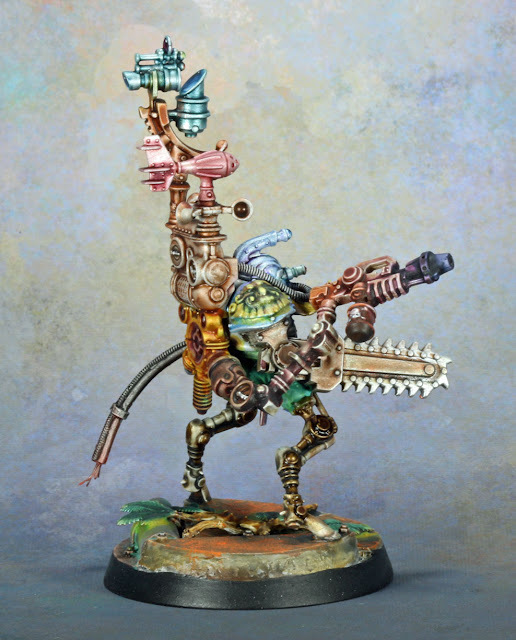 Crazy good idea and jawdroppingly beautiful paintjob and scheme. Squats that aren't a little loopy, really aren't Squats at all. Excellent way to describe squats!